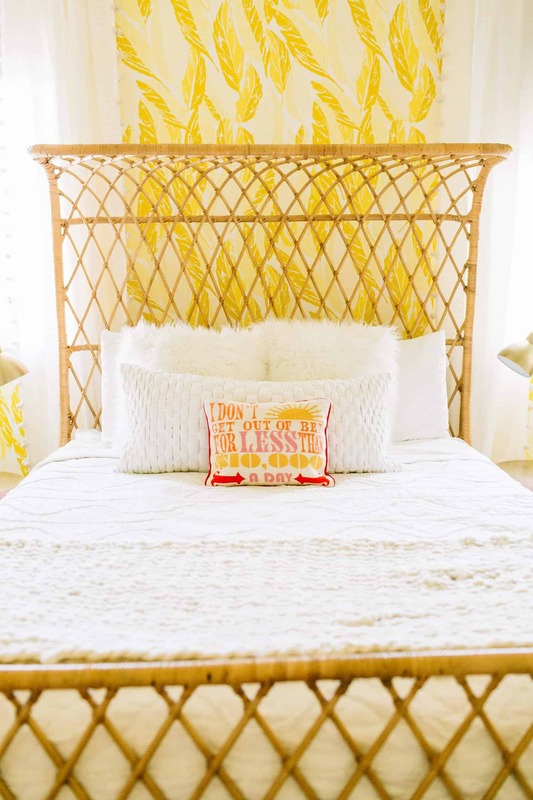 Today, I am so excited to finally share the before/after pics and full tour of our guest room! This room has been completed for a long time, but I just got around to shooting the full tour with all the views. One of the reasons, honestly, is probably because we have guests SO often. I had it on my shot list several times and had to move it because guests were using the room. Not a bad problem to have! 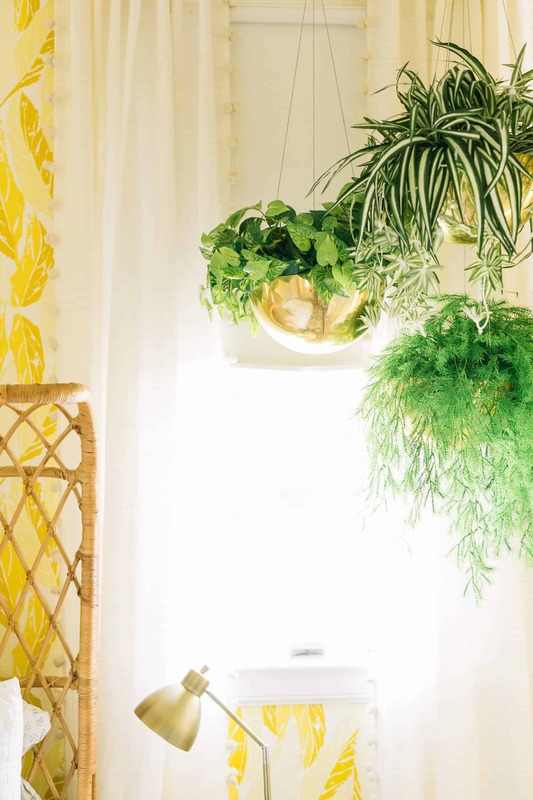 When we first moved to this home, we made a mood board (which I highly recommend doing anytime you move into or decorate a new space), and I feel like this room is one of the more bold rooms in our home. It fully embodies our inspirations! I hope you enjoy this tour … but first, a walk down memory lane. You can see more before photos here. This room is connected to our other guest bedroom with a jack and jill bathroom. When we bought this home it had more bedrooms than the other homes we were looking at, so we kind of lucked out! We decided to prioritize two guest rooms since we were moving about seven hours away from our family and we wanted them to feel welcome to come in groups and stay for longer. Two years later, we are so glad we made these two rooms because we have had countless guests—I went in the other day and realized that our guest book (which was only used a few times in our previous home) is halfway full. 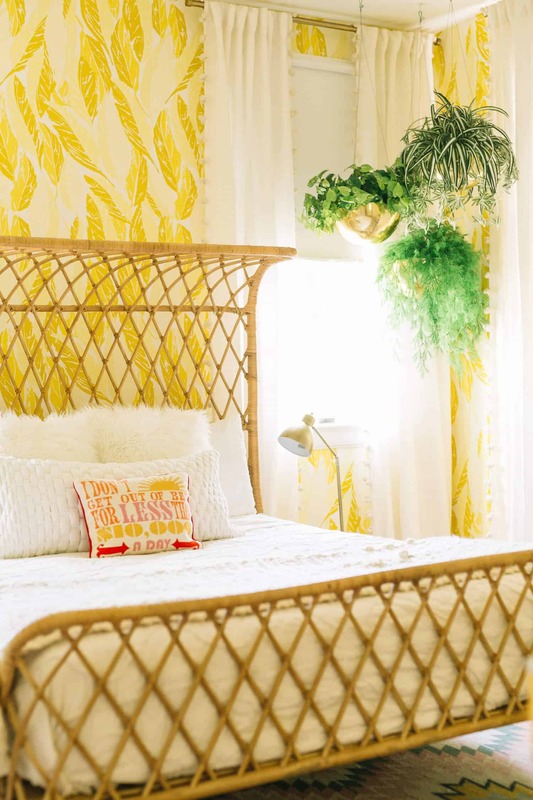 We decided to go more bold in our guest room because it’s not a room you spend as much time in as a main living space, or our own bedroom. 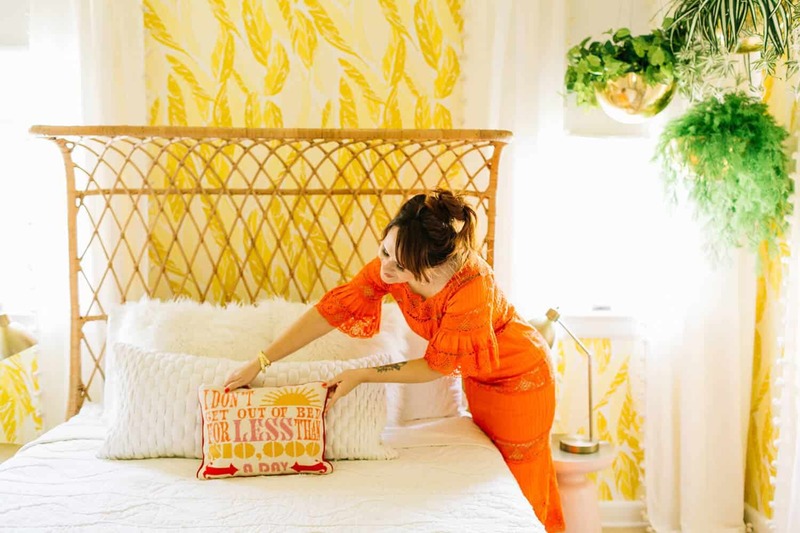 In a guest space, you don’t spend enough time in there to tire of a bold wallpaper or a lot of pattern and it’s really fun for guests to stay in. My dear friend Erin Barrett of Sunwoven gifted me this colorful weaving as a housewarming gift. I love it so much and it really fits in well in our guest room. 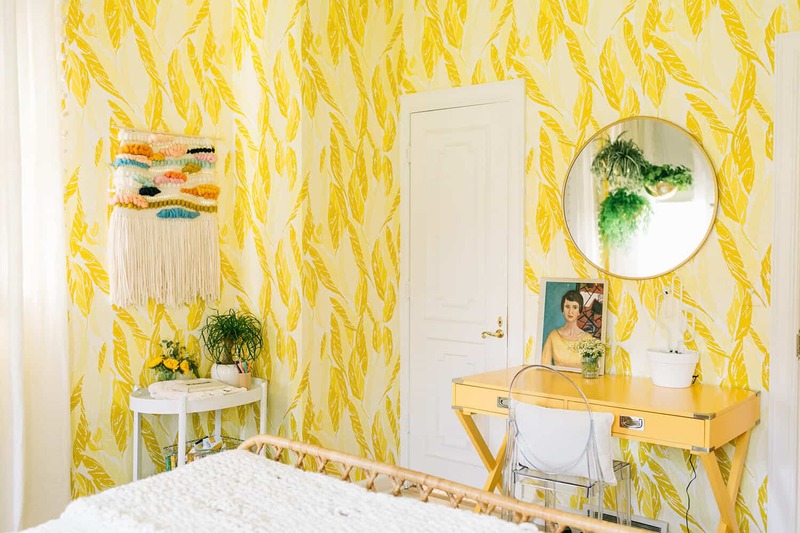 It’s by far the most sunny room in our home, because the yellow wallpaper reflects all around you. Emma gifted me this pillow a couple Christmases ago. It’s hilarious and makes me smile each time I see it. 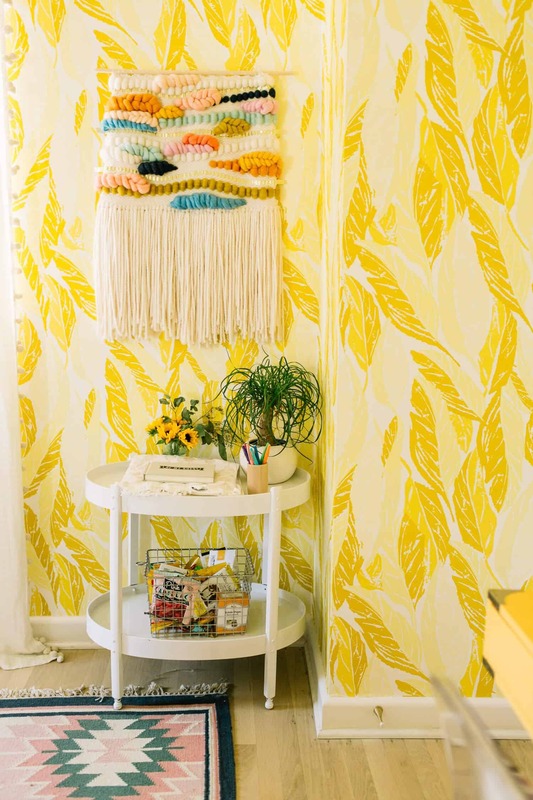 I am a HUGE Jonathan Adler fangirl. 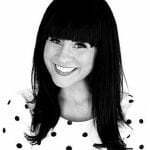 His book, 100 Ways To Happy Chic Your Life, is my design bible. I love his perspectives on loving what you love. Especially as a blogger where I often feel it’s my duty to chase trends, it’s nice to have an angel on my shoulder that’s like, “nah”. The mixture of colors and textures is overstimulating in the best way possible. 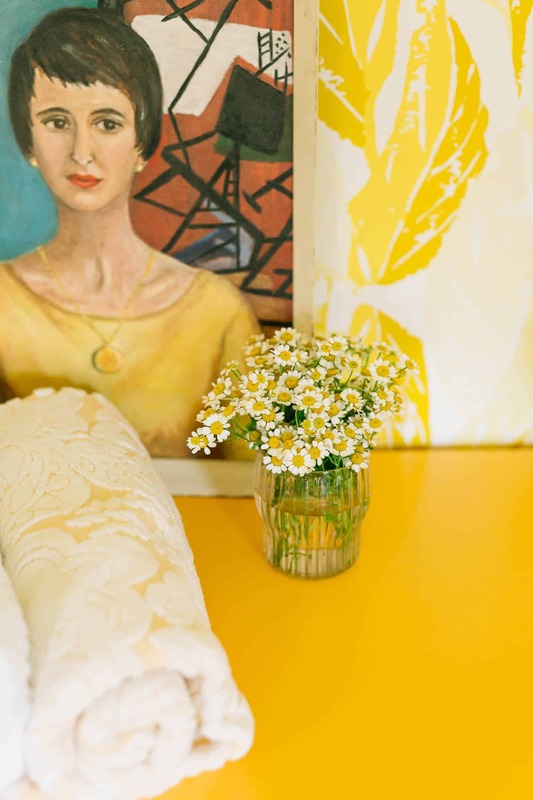 Our yellow wallpaper instantly made the room bright and cheery, and I designed the rest of the room around it. 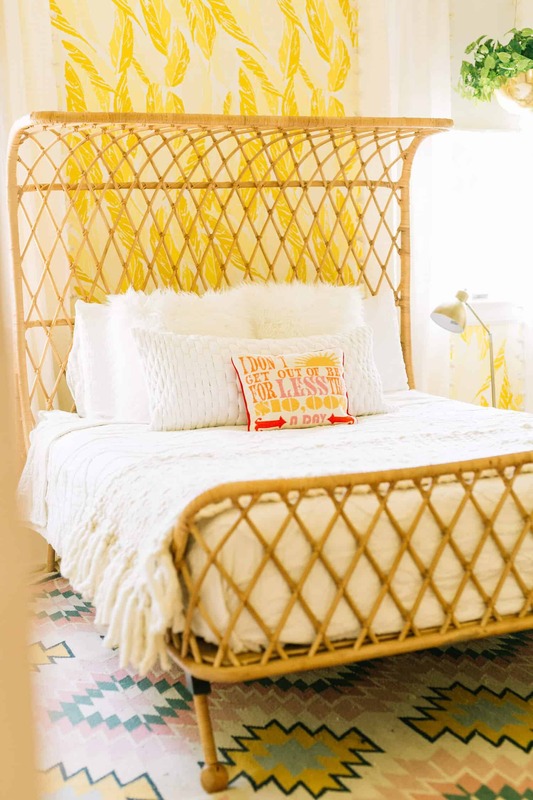 The rattan bed is from Anthropolgie. I get so many questions about it. It’s been a perfect guest bed! 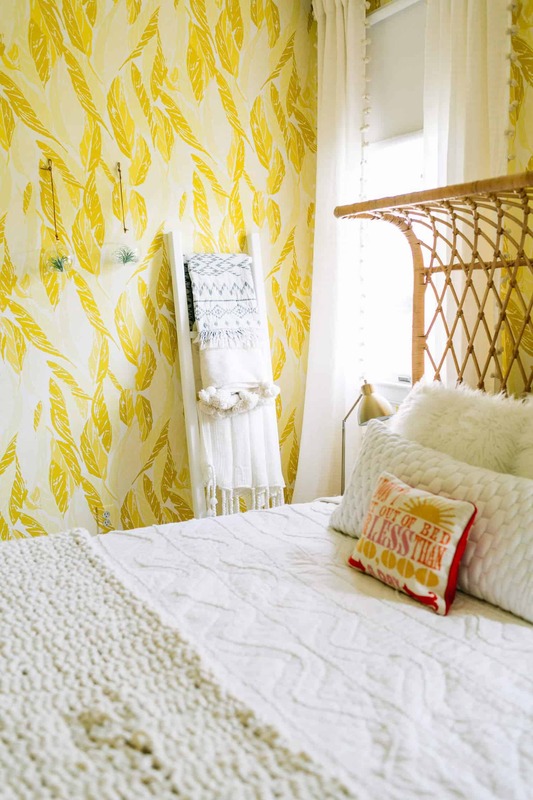 There are two details in our guest room that I really recommend adding to ANY guest space. The first is a guest book (here’s a cute one). 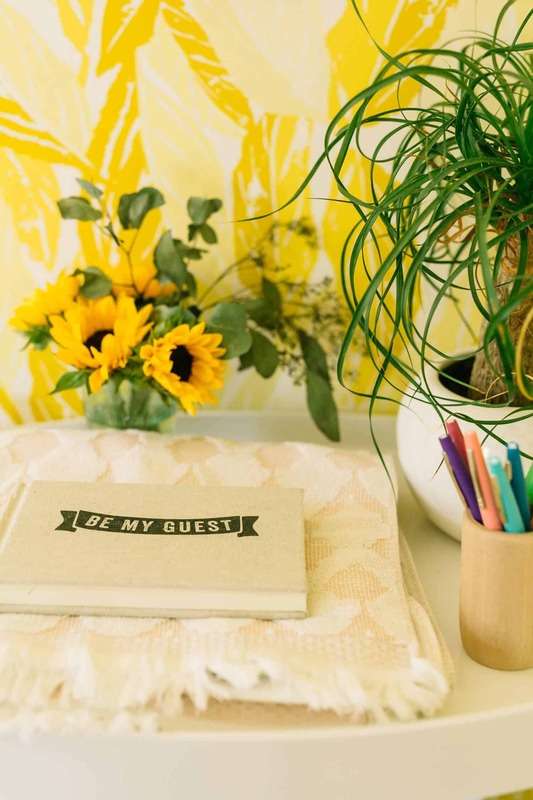 We leave it in the guest room with colorful pens and we don’t even have to ask people to leave messages—they just do. It’s so much fun to read them back later. Of course, the cutest messages are always from children. 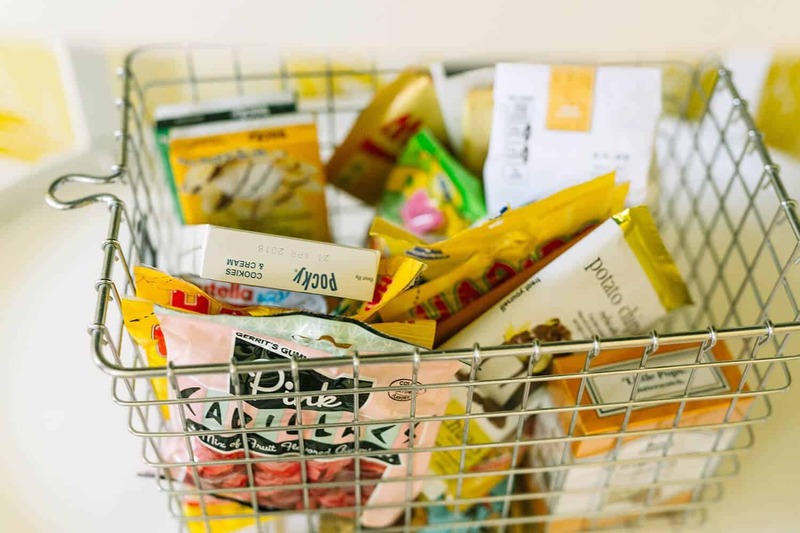 The other detail we swear by is a snack cart! I am always refilling it. It’s fun to find unique treats to add (although what people usually reach for is traditional junk food—haha—like chips and candy). We try to keep a mix of sweet and savory snacks as well as a bit of kid food and some bottled water. Our guests always comment how much they appreciate it. This side of the room doesn’t get into as many photographs, but I love it so much. We added a desk that we keep pretty minimal with just a lamp and sometimes some flowers. The door there goes into the guest bathroom. The painting is a portrait of my grandmother, Corina, painted in 1961 by a friend. It’s one of my most prized possessions. In my previous home it was hanging by the front door, but in this home it always seemed to fit into this room best. I found this pillow on Lulu & Georgia (seems to be out of stock now—similar here) and the painted desert rug is from Lulu & Georgia as well. Having a space ready for guests has brought so much joy to our lives. We have a lot of surprise and last-minute guests. It’s honestly our favorite way to catch up with far away friends and family with a late night bottle of wine and an episode of The Office. 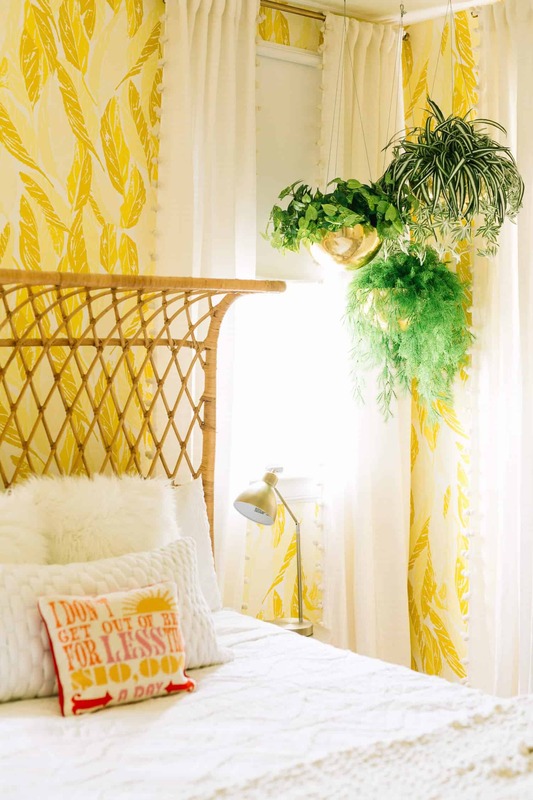 Sources: Bed/Anthropologie, Faux Fur Pillows/CB2, (similar here and here), Throw/CB2, Quilt/Target (similar), Side Tables/West Elm (in white), Gold Lamps/Target, Wallpaper/Hygge & West, Rug/Lulu & Georgia, Curtains/Anthropolgie, Hanging planters/thrifted (similar here), Weaving/Sunwoven, Pillows/Jonathan Adler (similar) and Lulu & Georgia (similar), Ghost Chair/Amazon, Guest Cart/Vintage, Desk/Amazon, Mirror/Target. It must look super sunny even on the gloomiest day! It’s so bright and cheerful, I love the colours! I just cannot imagine waking up with a bad mood in this room! Wow! I love the colors and the look of vintage with modern. Your guest room is amazing! I wish I had an eye for design and the discipline to keep my clutter under control. 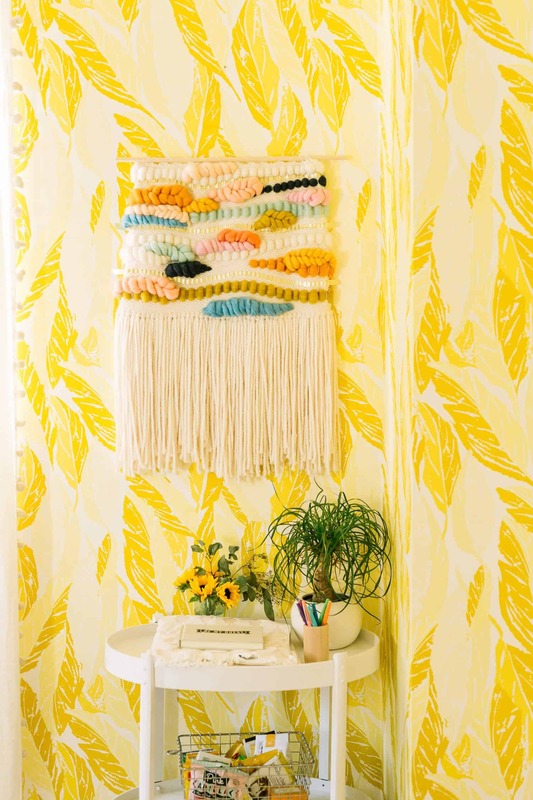 Yellow is a pretty ballsy interior colour but it somehow works in this room. Not my style but it looks great!! Wow! I love how bright the room is. And that snack cart is such a fun idea! I love this space! I would feel so happy seeing that sunshine yellow any time I walked in. 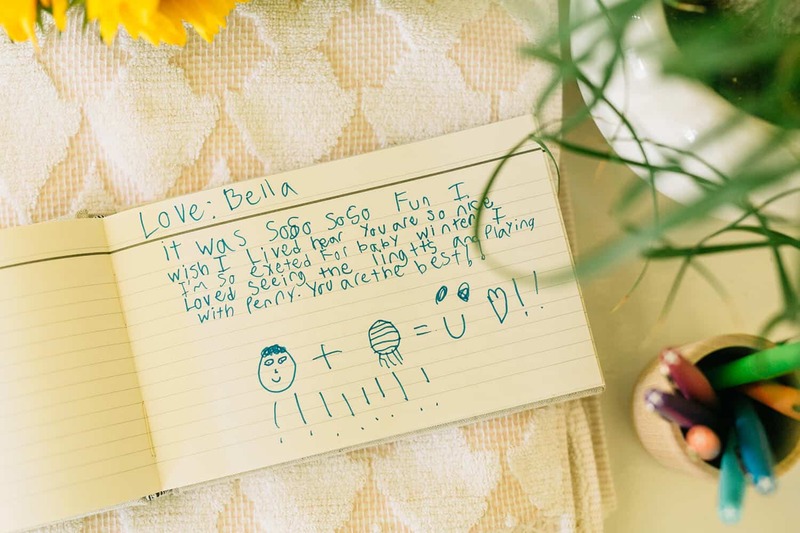 Your guest book is so cute too! I love your passion for having visitors and making them feel welcome, it is inspiring! That snack cart is a great idea. I adore your style. Its very modern and chic but always has a warm homey vibe. I have to say I need more adoption updates though, I am loving hearing your story!! 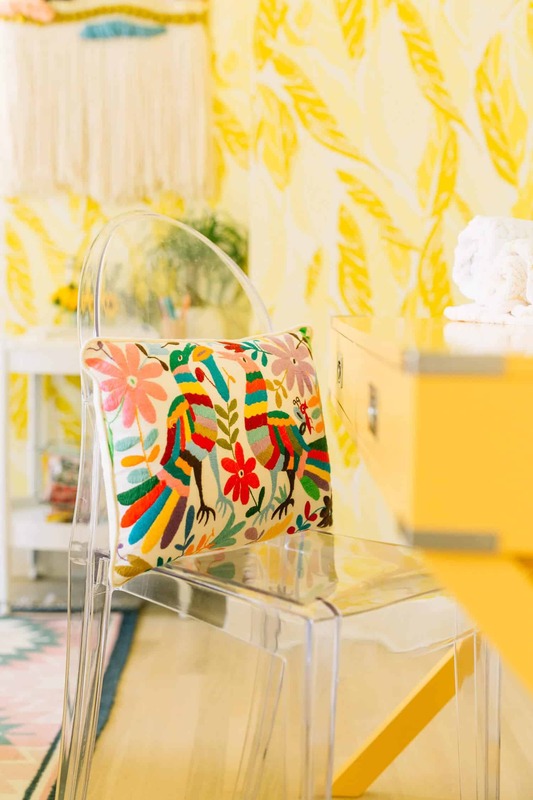 I love the bright pops of yellow! It’s so fun and refreshing! 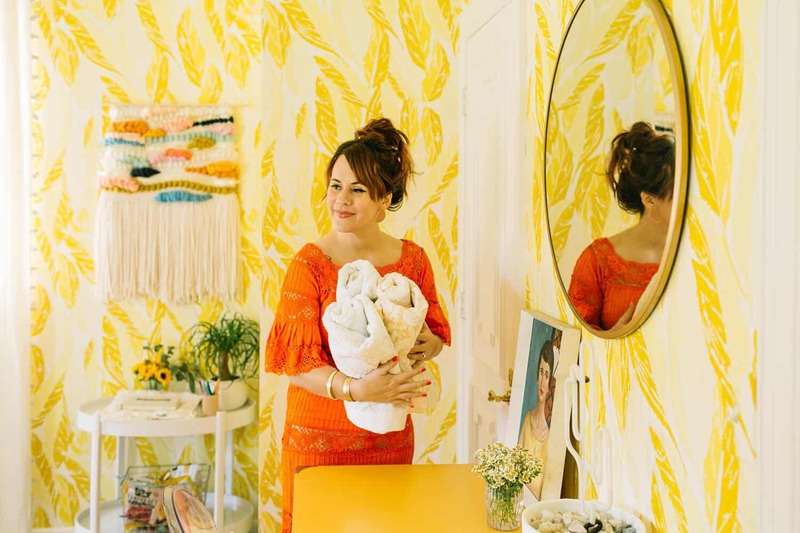 Can we all please take a moment to appreciate how effortlessly glamorous Elsie looks in her guest room with her guest towels? ? Love the whole room! Im glad we are receiving the full tour! 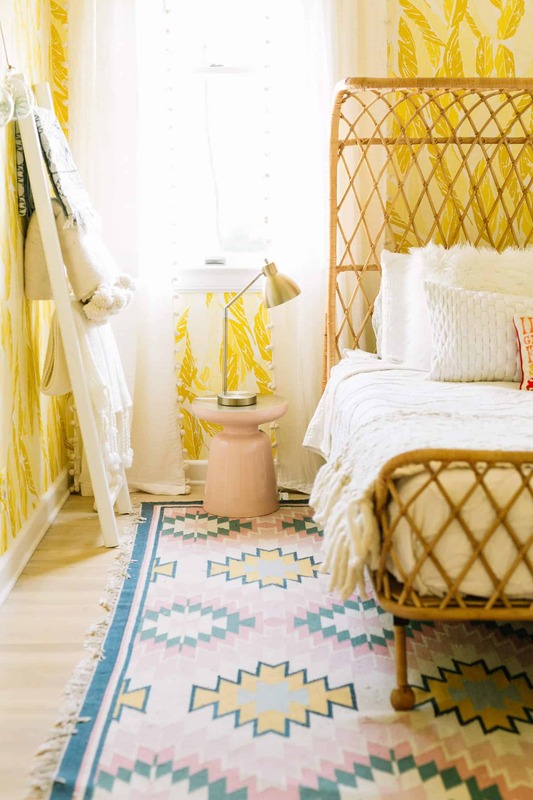 The ladder shelf that holds the extra blankets is a great idea, where is that from? I could use that for my guest space, they are all just stacked on top of a side table right now! Also, I must ask where did you snag that divine dress?!!! This room is sheer happiness! I’m in love. Love this room!! It’s just bursting with happiness and joy! Random question, and I mean it with love, hope it’s ok to ask–the painting of Corina is BEAUTIFUL, and I wondered if you would be interesting in making small prints of her to sell, and since she’s so dear to you, maybe the proceeds could go to a cause that means a lot to your family? Like adoption, special needs, immigration assistance, that sort of thing. I really hope this was ok to ask, and am counting on the admin approval to screen this first, definitely don’t want to cause upset. (Also why I’m posting anonymously, which I don’t normally do, my apologies). Every time I see Corina’s sweet portrait I love it more! She seems to represent elegance, love, art, and a little bit of mystery. Anyhow, love the space, too, thanks for sharing so much of your joyful, love-filled life with us! Thank you. I haven’t thought about it. If we ever do a print shop (we always talk about it, but haven’t gotten to it) I will ask her if she is ok with that. I love your idea of giving money to charity as well. I’m sure she will be flattered. So beautiful and fun! I love this. That wallpaper is the brightest, & sunniest, and I love it! I also love that little throw pillow on the clear chair. Great guest room!